Are you looking for that romantic getaway? Then you have discovered it…. 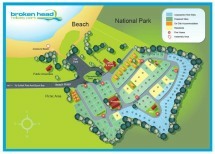 Broken Head Holiday Park is the destination you have been searching for. Stay in one of our lovely, private new Beach Shacks, which has a King size bed, a bathroom, bar fridge, coffee & tea making facilities, TV, DVD player and Austar, or you pack your tent, bring the van and stay on one our powered on unpowered camp sites. Ask our friendly reception about our special weekend package! Broken Head Holiday Park caters for anything you want your romantic holiday to be. For the romantics who just want to chill out and have and some R & R, to the more adventure seeking romantics and even those who need a little pampering or you can make it a combination of everything, it all about what your heart desires. If your looking for some R & R you can relax on your veranda of your beach shack and soak up the atmosphere of your spectacular surroundings, or take a stroll down to the beach and sit and listen to the waves crashing on the shore, You can watch a DVD (we have DVD’s available at reception) or check out the latest movies on Austar. Many of the other great things you can do is to go for a romantic stroll up the beach to Suffolk Park (takes about 25 mins) and if your feeling hungry you can choose from several places to eat. There is the Park Hotel, Pizza Paridiso, The Yellowflower Indian Restaurant, a bakery and a fish and chip shop. There are also several walks around the park which will take you to see some breathtaking views. If you wish to Spoil yourself you can indulge in one of several spa and health retreats located in Byron and If you have ever imagined going for a romantic horse ride along the beach then it’s a must to check out Tassiriki ranch located just south of Ballina, where you can take a ride along the stunning beaches. If you would like a truly unique and magical romantic experience take a sunrise balloon ride over some of the areas most spectacular scenery while enjoying a champagne breakfast. So when you are thinking your next romantic getaway then think Broken Head Holiday Park.